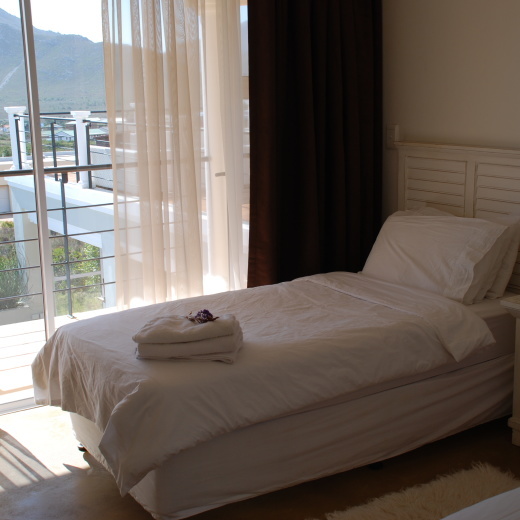 The villa is an up-market modern villa that sleeps 11 (8 adults and 3 children max) high up on the slopes surrounding the quaint village of Pringle Bay. This location provides a truly tranquil holiday setting in the natural African beauty whilst being less than an hour from Cape Town. Spectacular sunsets behind the distant peninsula can be viewed from the sun-deck and pool deck all year round. The village of Pringle Bay falls within a biosphere, an unfenced reserve, that ensures the indigenous flora and fauna remain protected. The Pillars has been positioned to offer stunning 270 degree views of the surrounding mountains, False Bay and The Cape Peninsula. The Pillars offers luxury accommodation consisting of 3 luxurious bedrooms and a bunkroom for 3 children, all en-suite with an additional outside annexe. There are all the necessary facilities for a relaxing holiday by the sea including a sauna, plunge pool and split level swimming pool. The house sleeps 8 adults and 3 children in total. The house has been designed to enjoy protection from the wind when lying and relaxing overlooking the infinity swimming pool within a lovely private deck and entertainment area. Should you wish to enjoy the beach it is a mere 5 minute drive away. The main living space consists of a lounge area, dining area, large open plan kitchen with breakfast/bar counter.